story to come. 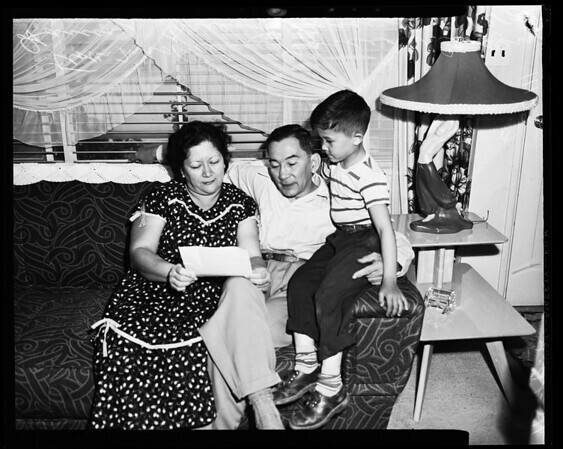 Two negs show Cesar Garcia, 54, his wife, Pilar, 45, and their son, Ernest, 7, looking over telegram from Congressman Cecil King who introduces a bill in congress asking that Mrs. Garcia be made a citizen. Garcia, a navy vet and hero of Corregidor and prisoner of Japs, arrived here with his wife in 1946. Wife thought she was citizen but immigration authorities told her recently she would have to leave country and go back to Philippines. They live at 506 West East Street, Wilmington. ".